The IRS again this year reminded U.S. citizens residing overseas of their tax return filing obligations. The filing deadline is Monday, June 15, 2015, for U.S. citizens and resident aliens whose tax home and abode are outside the United States and Puerto Rico, and for those serving in the military outside the U.S. and Puerto Rico, on the regular due date of their tax return. To use this automatic two-month extension, taxpayers must attach a statement to their return explaining which of these two situations applies. See U.S. Citizens and Resident Aliens Abroad for details. Nuances of FBAR – Foreign Bank Account Report Filings – for USCs and LPRs living outside the U.S. Does the IRS have access to the USCIS immigration data for former lawful permanent residents (LPRs)? Information about former LPRs, such as the individuals names, is not published under the statute, IRC Section 6039G, which only covers former U.S. citizens. This raises the question of whether the Department of Homeland Security tracks former LPRs – names and addresses overseas and provides that information to the Internal Revenue Service? The new I-407 Form requires much more information and is 2 pages in length. The old form had only 6 lines and was less than 1/2 of a page in length. These forms are set forth here. The new form requires the address overseas of the individual. Of course, the IRS can easily select and identify individuals for audit, by simply drawing from the published names of former U.S. citizens, which is currently tracking at an average of about 850 former USCs quarterly. In contrast, the number of former LPRs who have filed USCIS Form I-407 is tracking at an average of about 4,000 to 5,000 individuals quarterly. While citizens are often the focus of the public press and Congress regarding “expatriation taxation”; the statute also wraps in so-called “long-term residents.” These are individuals who had or continue to have “lawful permanent residency status.” There are numerous technical considerations in this area, but needless to say, the number of former lawful permanent residents who have simply filed Form I-407 – Abandonment is far in excess of those U.S. citizens who have filed for and received a Certificate of Loss of Nationality (“CLN”) – Form DS-4083 (CLN). The graph reflects the enormous difference. It seems fairly easy, from a legal perspective, that the IRS can request the names, addresses (and indeed the newly completed form) from the USCIS of all individuals who have filed USCIS Form I-407. From the USCIS records, the IRS will be able to determine if the individual was a “long term resident” based upon the number of years the individual had such status. This entry was posted in Certification Requirement of Section 877(a)(2)(C), Immigration Law Considerations, IRS Audit Techniques - Expatriation, Lawful Permanent Residents, Statistics. 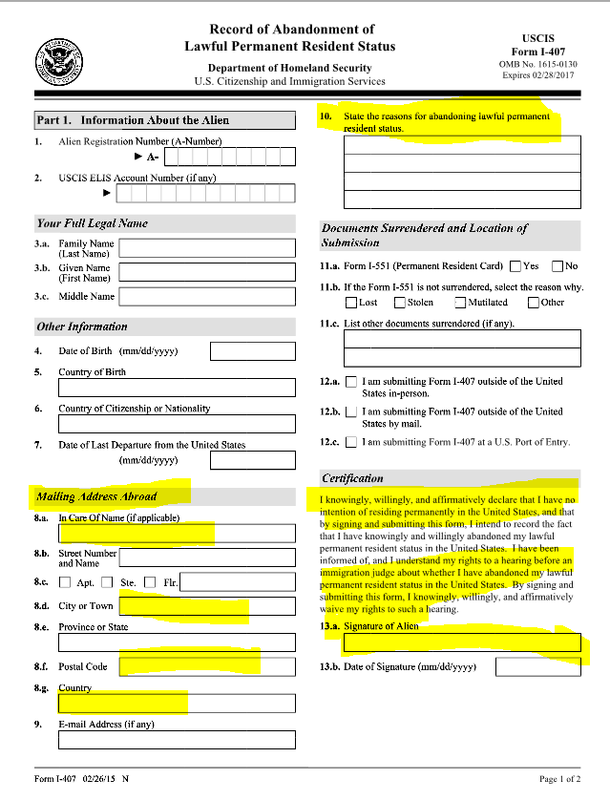 Page 1 of 2 of this form is replicated here. and provided to the IRS. Former “long-term residents” have extensive U.S. tax compliance obligations, including certification requirements under Section 877(a)(2)(C) to avoid “covered expatriate” status and the various adverse tax consequences. Some of the important records that are maintained by DHS/USCIS, include the following, much of which can be helpful in the enforcement of U.S. federal tax obligations. Alien Files (A-Files) are maintained in electronic and paper format throughout DHS. Digitized A-Files are located in the Enterprise Document Management System (EDMS). The Central Index System (CIS) maintains an index of the key personally identifiable information (PII) in the A-File, which can be used to retrieve additional information through such applications as Enterprise Citizenship and Immigrations Services Centralized Operational Repository (eCISCOR), the Person Centric Query Service (PCQS) and the Microfilm Digitization Application System (MiDAS). The National File Tracking System (NFTS) provides a tracking system of where the A-Files are physically located, including whether the file has been digitized. The databases maintaining the above information are located within the DHS data center in the Washington, DC metropolitan area as well as throughout the country. Computer terminals providing electronic access are located at U.S. Citizenship and Immigration Services (USCIS) sites at Headquarters and in the Field throughout the United States and at appropriate facilities under the jurisdiction of the U.S. Department of Homeland Security (DHS) and other locations at which officers of DHS component agencies may be posted or operate to facilitate DHS’s mission of homeland security. Subsequent posts will discuss how and when the law allows the IRS to access these records. This entry was posted in Certification Requirement of Section 877(a)(2)(C), IRS Audit Techniques - Expatriation, Lawful Permanent Residents. The new form has additional information compared to the prior form. Specifically, the Alien Registration Number and USCIS ELIS Account Number is required to be included. Now, the individual is required to state the reasons for abandoning lawful permanent residency status. Responses to each of these questions will have important legal consequences, including potential tax implications under IRC Sections 877, 877A, et. seq. See, for instance a prior post: What could be the focal point of IRS Criminal Investigations of Former U.S. Citizens and Lawful Permanent Residents? One of the important enforcement and practical questions raised, is: Will the IRS be able to better track former “long-term residents” (certain former lawful permanent residents) for purposes of the “expatriation tax” under the new reporting form and system? As has been explained, if an individual fails to certify under the tax law, they will necessarily be a “covered expatriate”; even if they do not meet the asset or income tax liability thresholds. See a prior post, Certification Requirement of Section 877(a)(2)(C) – (5 Years of Tax Compliance) and Important Timing Considerations per the Statute. This entry was posted in Certification Requirement of Section 877(a)(2)(C), Immigration Law Considerations, Lawful Permanent Residents.